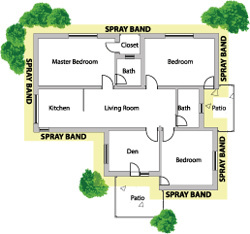 This program is designed to prevent pests from entering your home by creating a barrier that shields your home with maximum protection against ants, spiders, earwigs and many other invading insects. We treat a band of soil five feet wide around your home and up the foundation to a height of four feet where pests are active and many find an entrance. Your specialist is trained to treat potential problem areas such as: cracks, windows, doors, eaves and down spouts. There are 5 applications throughout the season to ensure optimum protection. We guarantee our Perimeter Pest Control, so if you have any issues between your treatments, simply call us and we’ll reapply the application at no charge to you. Call to schedule your Perimeter Pest Control treatment today!